Cats can be very playful creatures and so there’s no reason for their toys to be limited to just mangy stuffed mice and battered old scratching posts. There are a variety of fun items available which you may never have thought of that should have your cat purring even louder than usual. Cat trees are essentially large multi-levelled scratching posts offering various little nooks and crannies for your cat to lounge around and play in. They are available in various different designs and sizes and come with ladders, hammocks, dangling toys and anything else a cat could dream of. They aren’t something every cat owner would like to have in the corner of their living room, but are a must for anyone who likes to really spoil their pet. A cat laser may sound a little dangerous but is in fact a harmless toy that will captivate and mesmerise your little feline friend for hours on end. When activated, the small battery-powered device shines a laser that darts around your floor and wall, pausing intermittently in order to trigger your cat’s innate curiosity and instinct to chase. This is the mouse on a string redesigned for the 21st century and doesn’t require the patience of a tireless owner to operate. For less than a tenner it is a must-have for cat owners. The cat tunnel is an unusual tubular play area with a fluffy, catnip filled mouse as its centrepiece. The idea is that your cat will be enticed inside by the mouse and luxurious velvet lining and then have the time of his life rolling around whilst rocking back and forth. 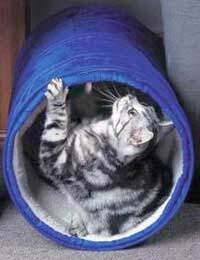 The cat tunnel also makes an unusual crinkling sound designed to excite your little furball even further, making this a great all-round experience for any cat that tends to be playful in nature. A cat tunnel will take up a little more room than you average cat toy, but fortunately they can fold down flat, making them easy to store away when not in use. If your cat likes to sit and watch the TV with you, then why shouldn’t he have his very own DVD to watch alone? While cats may not be able to keep up with the complex story lines and well thought-out character development that humans can, they are often incredibly entertained by images of schools of fish darting around the ocean or snooker balls shooting across tables. These specially produced DVDs feature constantly changing, action-packed scenes, designed to hold your cat’s attention for as long as possible. There are several different editions available and are all fairly reasonably priced. Play gloves are large padded gloves which allow you to play with your cat without getting scratched. They have reinforced, elongated fingers with leather tassels on the end, allowing you keep your cats attention with the slightest movements of your hand. It’s like having 4 strings for your cat to chase at once, meaning it’ll be a long time before he gets bored of this one. The thumb of the play glove even contains a bell so that his ears should remain as wide as his eyes when you bring this little toy out to play. This is a great item for cats that like to play rough, and looks pretty funny too. If your cat needs a scratch post to stop him tearing up your carpets and ripping down your wallpaper, but you don’t like having an unsightly beige stick in your hallway, then this is the scratch post for you. The post is designed to look like a beautiful exotic palm tree, which will spring back and forth as your cat scratches and plays. The stand looks like a sandy, sun-baked beach and there is even a little fluffy monkey to really set the scene of a far away tropical island. Let’s just hope your cat appreciates it as much as you will.